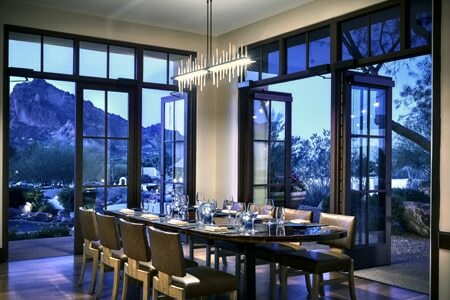 American cuisine in a landmark Scottsdale resort. : Lincoln Restaurant’s dining room is quietly elegant, but the most popular seats are on the patio, and savvy diners know to reserve there to salute sunset views of Camelback Mountain. Start your meal with Yorkies, steaming hot, bite-size English Yorkshire puddings striped with black pepper and Arizona cheddar and melting with hand-churned butter. And what’s not to like about bold dishes such as battered, fried crispy beef cheeks lounging on Bob’s Red Mill rye porridge and wild mushrooms spiked with fresh shaved horseradish? Chef Chris Neff has reinvented American classics, and delights with signatures like a full pound of 30-day dry-aged rib-eye, dressed in bone marrow alongside whole blistered shishito peppers and roasted potato wedges. A must: cocktails from the adjacent Bar 1936, like the Copper State Sour of Park Rye whiskey, lemon juice, agave syrup, house-made grapefruit bitters and a froth of egg white.